Are you interested in connecting with a new transdisciplinary research program? A team of researchers statewide is investigating how to build resilience to extreme weather events in the Lake Champlain Basin and integrating the interactions of climate, environment, and society. The Basin Resilience to Extreme Events (BREE) program has a large and broad network of researchers available to mentor teachers interested in increasing their content knowledge through research. We work with social scientists, lake ecologists, watershed hydrologists, community ecologists, biogeochemists, geographers, and climatologists, to name just a few. Browse the BREE People page to see each research faculty's area of expertise. 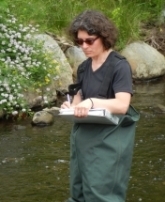 Join us for a day of learning about macroinvertebrate communities in Vermont streams. 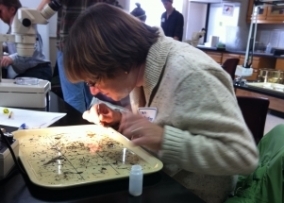 Involving students in sampling and identifying macroinvertebrate communities is a terrific place-based, hands-on approach to teaching standards addressing earth systems, ecology, human activities and impacts on natural resources, biodiversity, and environmental change. Workshop participants will create a page for their own stream site on the Vermont EPSCoR Streams Project WikiEducator page, which because of the Wiki nature of the site, can be adjusted by the educator in the future as needed. 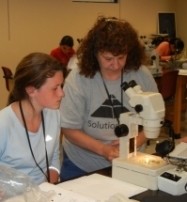 We have a variety of outreach modules we can offer to your classroom that will expose students to current scientific research in Vermont, and connect middle level teachers to mentors in the university research community. This exposure helps to increase science literacy and provide student insight into possible careers in science. We strongly encourage individuals with disabilities and individuals from traditionally underrepresented groups to join us. Contact us to become part of a research community that engages and challenges youth in science, technology, engineering and mathematics (STEM) and social science fields. We want to match you with the research opportunity that best meets your interests. Please let us know more about you and what type of research you would like to participate in. We will use this information to connect you with a BREE researcher that complements your research interests!